Welcome to issue one of TTGUK Paints: Test of Honour! Last time around we painted a bit of a favourite around here ArcWorlde and had great fun doing it. I’m sure there will be more on that front later in the year because of all the new stuff but for this challenge we have decided to do 24 point forces which is a decent size and gives us all lots of nice options. The best thing about doing these challenges for us is that we get to be competitive here at the tower! Another TTGUK Paints is upon us and this time its Warlords Test of Honour, a game I have been casually looking at, its seems okay. Oh alright, yes if you’ve been following me on here or the ToH Facebook group you will know I’ve been posting like a man possessed (click here for a taste of that madness – Ed.). The era is something I know a good amount about and it’s one of my favourite game types (Vikings being the other). So painting stuff for it is like a dream come true. My force is the max allowed samurai and then some commoners to act as speed bumps and tire out the enemy. It’s a good mix of troops from the core box. Clan wise I’m going for the Okubo, they’re not well known, or a really big one but I like their history. They played a very important part in some big battles and even lead the vanguard a few times (First into the fray, a huge honour). Onto colours; I’m going to make sure my Samurai look different and are well turned out. My Commoners will be a mix of colours, the Clan Mon being what pulls them all together. My bases will fit around the terrain I’ve already done, so slate, ferns, flowers and lots of cherry/maple leaves. I had not heard of Test of Honour before joining the TTGUK team, but I love to take part in build, paint and play groups so I jumped in feet first on the pre-order. I received a bucket load of models and not a clue what I was looking at or what sort of force I wanted to take. After looking through everything I had I decided to just go with the models I liked the most and was most looking forward to painting. My next problem was I liked all the models and couldn’t choose what ones I liked the most, so here is what I finally went with. Samurai hero, mounted samurai, experienced Bowman unit, single Bowman, 2 loyal spearman units, a banner bearer and a Sergeant. Now to try to get them all built! When unboxing Warlords latest game Test of Hounour I was pleasantly surprised to see some cardboard scenery, which I presume is an idea taken from the kara 9 starter box, but I digress in to territory covered by Marks video, so back on track and starting only with the core box I am somewhat more limited for options than some of the other guys but am determined to make the best of it and get cracking so to start off with I decided to build the force from the starter book. One samurai, two ashuguri archers and three ashuguri spearman, but that didn’t even get close to the 24 point limit so back to the drawing board. I have to use the unarmoured samurai model that came with the pre order as it’s pretty awesome. 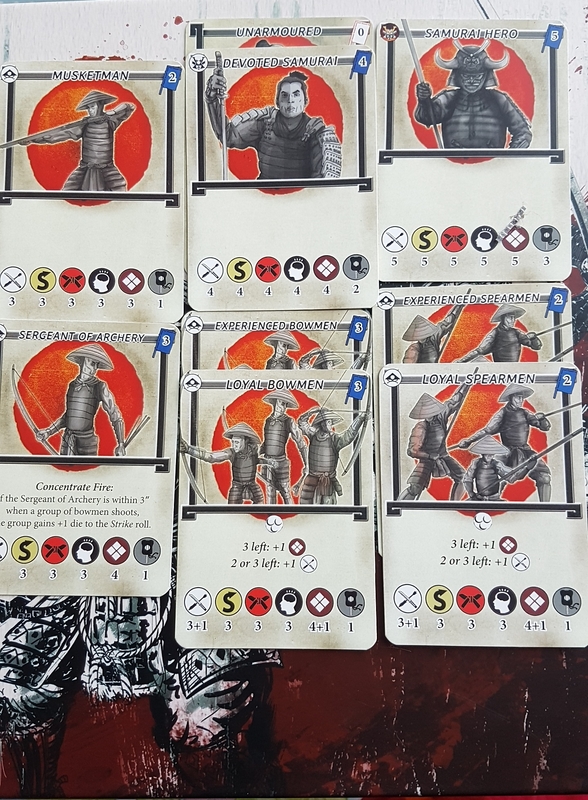 Coupled with 6 archers a musketman, some spear men and a sergeant of archery, if I can keep the archers bunched together that should hopefully have me spamming out 5 attack dice per turn for each unit! That’s the theory anyway. Sadly I’ve not had much of a chance to get started on this yet. I’ve been much too busy gluing up more Veer-Myn for Deadzone! Still at least the others aren’t too fat along so I’ll catch up quickly..
That’s all folks, next week there will be all sorts of painted goodness I can assure you and maybe even a finished figure or two? Plus Jez and Mark will be doing a battle report very soon!